A handful of folks saw me at Costume College plying yarn with my homemade drop spindle. A drop spindle made from things you can find around the house (well, my house, anyway). Now, I have a very nice, wooden drop spindle, but it has yarn on it that I don't want to take off yet. So I needed second spindle. I made one using these instructions, though I didn't want to hunt for the plastic grommet, so I hot glued the disks in place (I glued one disc on at a time, letting the glue cool a little first, and spun the dowel while the glue was cooling, to keep the dowel centered and the glue even). Once I plied all the yarn, I needed to get it off the spindle so that it could get a quick wash to set the twist. I don't know if this next tool has a name; it's a box with holes and slots cut in to hold the spindle while I pulled the yarn off. Spindle holder? Spool winder? Spinny thing? I don't know what to call this box-with-holes cut in. Lastly, here's my...well, let's be honest, this is the GHETTO-est yarn swift ever. It's a box on a small lazy susan. The ghetto-est yarn swift ever. Oh wait, one more tool was involved. I don't have a yarn winder, so I hand wind on a nostepinne. Except that I don't have a nostepinne, I use a clean chopstick. My "winding stick" (a chopstick). I'll show you later what I actually made from this yarn (which I was also carrying around with me at Costume College). 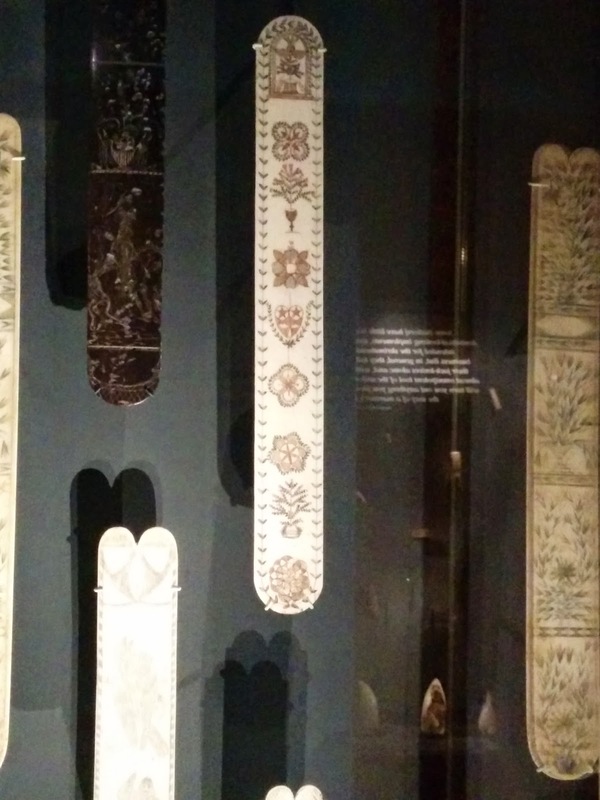 Now, for the yarnies that are still with me, here's a treat: I was at the Whaling Museum in Nantucket just recently, and found these beautiful, whalebone yarn swifts. Whalebone yarn swift at the Whaling Museum in Nantucket. It's such a delicate thing, can you imagine it being actually used to wind yarn? Moreover, can you imagine the labor to make this thing (each strut is ornamented) and the feelings of the woman who would have received it? She had better have been gratified. The museum had a couple of whalebone swifts. Whalebone objects at the Whaling Museum in Nantucket. These were displayed with several whalebone knitting needles, sewing clamps, and some other objects that I didn't take note of. 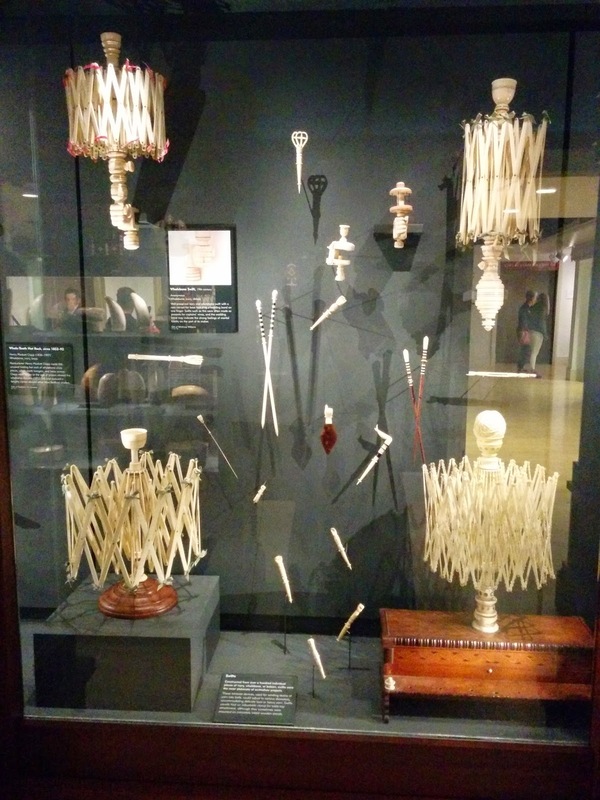 These objects are made from bone and not baleen, which is the "whalebone" used for corsetry. I saw some samples of unprocessed baleen, but didn't get a photo. 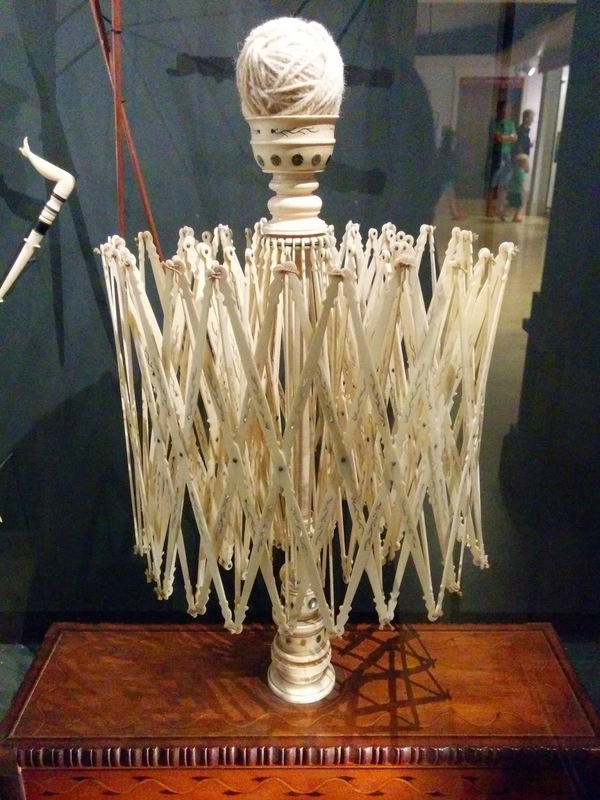 And of course, one can't discuss objects made from whalebone without mentioning BUSKS. 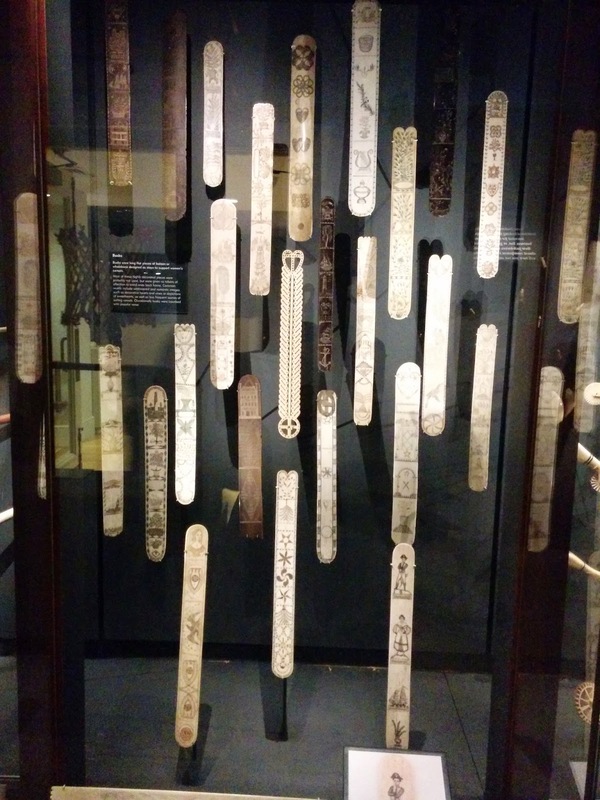 Whalebone busks. The darker one might be baleen, I didn't read the label. The museum has managed to get a hold of quite a few beautifully carved busks. The Whaling Museum is very nicely done. A lot of time (and money, probably) has gone into the displays, and there are some very nice talks (though skip the movie, it's heavy on "isn't this island great" and way to light on history and facts; the presentation on the history of whaling was VERY good, however). If you happen to be on Nantucket Island, I recommend a visit. Yes, I know, Costume College was TWO weeks ago. What can I say, I'm not a very diligent blogger. I was thrilled to be back at Costume College this year. I missed last year, due to other commitments. I didn't have much to contribute to the neverending parade of GORGEOUS costumes though. As you can see from the quietness of this blog, I haven't been sewing much. So, the weekend included a minimum of costumes for me, but also plenty of socializing and oggling. For the Friday Ice Cream Social I wore a vintage dress I recently acquired. Vintage dress from the 1950s. Photo courtesy of Amy O.
I got this dress from Etsy seller youthstep, and I just love the use of lace. Inside there's a label that says "Rappi," anyone know anything about this designer? I do not have a figure for vintage dresses, and this one proves it (the bust is quite a bit too big). 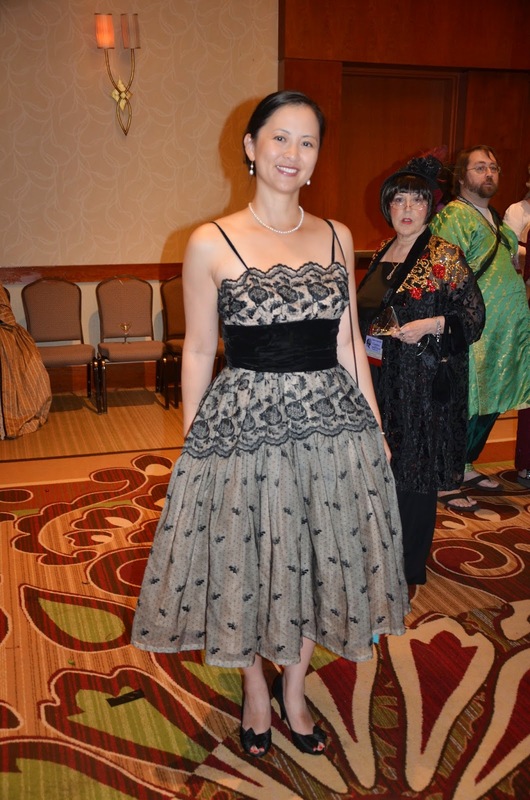 For the Gala I wore my 1950s-style ballgown. I also put my red french gown in the exhibit room. CGW lent me a very jaunty mannikin, which was no fun to dress. As for classes, I popped in and out of quite a few, and soaked up as much as I could. I took the limited glove making class, and made a glove. I stopped at one. The fit wasn't quite right (some of the fingers are too short) and my construction technique could really use some work. I'll fiddle with the pattern and try again in the future, but in the meantime I found a pair of leather gloves in the Marketplace. Very dirty leather (possibly kidskin) gloves. They fit nearly perfectly, which is a surprise, since commercial gloves never fit me so well. They are filthy (hence, they were cheap), and they need a good conditioning. So cleaning and restoring these gloves is a future project.